I was supposed to get this recipe up for you on Saturday, so apologies to all who were waiting for it. 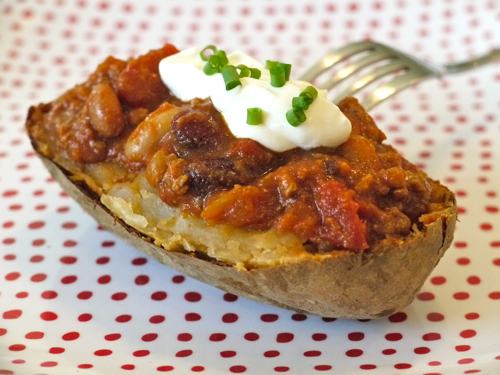 This Four Bean Chili Baked Potato is the last installment in my latest 5-in-1 recipe plan. I'm all about recipes that take as little work as possible, especially when friends are coming over. Call me lazy, call me simple, call me whatever you want, but at the end of the day, when I finally get some time to play, I just want to have some fun and not worry about what's happening in the kitchen. Now that I've got leftover chili from Super Bowl in the fridge, I know that all I have to do tonight is pop some potatoes in the oven to bake and then top them off with the chili and our favorite accompaniments. I'm a seriously happy mama! 2. Using a fork, poke a few holes on the sides of the potatoes (so they don’t explode in the oven!) and bake for 50 minutes. 3. Slice potatoes in half and top with chili. 4. Serve with desired accompaniments. It's a healthier version of chili fries! Gotta try this one, thanks. Hello my name is mariana wahba from toronto canada am here to share a real live testimony on how i got my ex back and cured of hsv2. i was sufering from hsv2 since a year ago because of that my husband began to loose interest in me and started acting strange he started coming home late and many more.so finally he signed for a divorce and left me.for another woman. and i loved him so much so i decided to find a way to get him back. so i told to my Friend Linda. so she introduced me to a spell caster and a herbal Doctor called Dr peter she gave me his contact so i contacted him and i explained to him he promised to help me so i trusted and believed him. he first helped me to cast a love spell and my husband came back to me on his kneels begging me that he is sorry for all he has done to me. i was so happy so after he was back to me i also told Dr peter about my hsv2 Virus and he also helped me with a very powerful herbal medicine which i took for 6 days and after that i went to the hospital for checkup and i discover that i was free from herpes simplex virus(hsv2). all thanks to Dr peter for his super powers and herbal medicine. you can also contact him for help like cure for any any kind of sickness and disease, lottery and money spell,pregnancy spell and so many more.you can contact him today via whatsapp/call +1(321)754-0649 mail [email protected] OR [email protected] or read more about him on his website http://magnificentspellcast.website2.me or blog http://magnificentspellcast11.blogspot.com and get you solution fast with a 100% guranteed. So how many days can the chili be stored in the fridge? These 5 in 1 chili recipes were excellent. I hope you can do this series again with a different item. They really do help busy or working moms whip up quick, tasty meals for the family. It all depends on what is being used. Generally when one thnkis of seasoning it includes a generous amount of sodium, which is not altogether healthful in large amounts. Spices are basically plant derivatives that are used to give flavor to foods. They include just about anything on your spice rack: cayenne, cumin, rosemary, thyme, dill, etc. Herbs are generally less processed than spices (basil, cilantro, etc ) so they are probably a little more healthful. But honestly seasoning and spices are usually used in nutritionally inconsequential amounts, so their health effects are not very apparent. Herbs on the other hand are usually prized for their medicinal purposes, so it would seem that these are generally more healthful than spices.